There were no cross reactivities obtained with human Osteopontin, and human Bone Sialoprotein. Our Abpromise guarantee covers the use of ab14174 in the following tested applications. 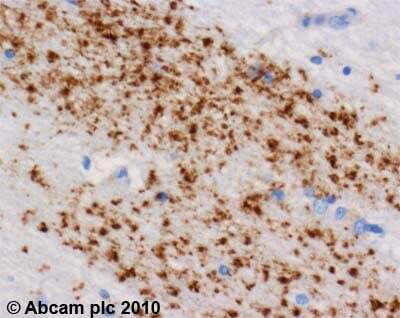 Immunohistochemistry (Frozen sections) - Anti-SPARC antibody (ab14174)This image is courtesy of an anonymous abreview. ab14174 at a 1/100 dilution staining SPARC in mouse endochondral bone by Immunohistochemistry (frozen sections) incubated for 16 hours at 4°C. PFA fixed. Permeabilized with 0.1% Triton. Blocked using 20% serum for 50 minutes at 19°C. Secondary used at 1/200 polyclonal Donkey anti-rabbit conjugated to Alexa Fluor 555 (red). Counterstain (blue) DAPI. ab14174 (1/1000) staining SPARC in human substanta nigra using an automated system (DAKO Autostainer Plus). Using this protocol there is strong staining of the cytoplasm and extracellular matrix. 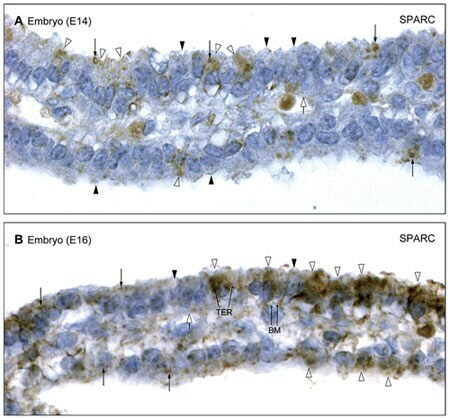 Immunohistochemistry (Formalin/PFA-fixed paraffin-embedded sections) - Anti-SPARC antibody (ab14174)Image from Liddelow SA et al., PLoS One. 2012;7(3):e33554. Epub 2012 Mar 21. Fig 6.; doi:10.1371/journal.pone.0033554; March 21, 2012, PLoS ONE 7(3): e33554. Immunohistochemical analysis of E14 and E16 mouse choroid plexus tissue, staining SPARC with ab14174. Sections were blocked with blocking agents and incubated with primary antibody (1/10000) overnight at 4°C. Staining was detected using DAB. Publishing research using ab14174? Please let us know so that we can cite the reference in this datasheet. I would like to test ab14174 for use on pig samples. I am very pleased to hear you would like to accept our offer and test ab14174 in pig. 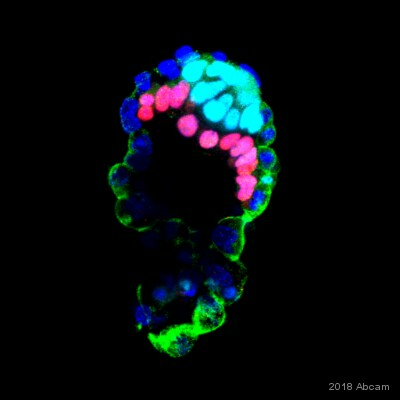 This code will give you 1 free primary antibody before the expiration date. To redeem this offer, please submit an Abreview forpig and include this code in the “Additional Comments” section so we know the Abreview is for this promotion. For more information on how to submit an Abreview, please visit the site: www.abcam.com/Abreviews. Hi what is the amino acid sequence used as the antigen for the SPARC antibody? Thank you for your enquiry. The immunogen for this antibody is recombinant full length Human protein. I hope this information helps, please do not hesitate to contact us if you need any more advice or information. Thank you for your enquiry. Ab19528 has been removed from our catalog. 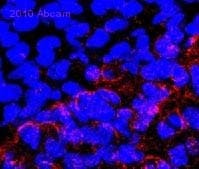 Ab14174 is a polyclonal antibody that was raised to the full length SPARC protein. Therefore, the antibody should recognize epitopes along the entire protein. I hope this information helps, please do not hesitate to contact us if you need any more advice or information.